1. Marinate for maximum flavor. For maximum juiciness and flavor, marinate chicken for at least 4 hours or overnight. You can go with a brine (water flavored with salt, aromatics, herbs, and spices), or do what some restos have been doing and use buttermilk. How can you make your own buttermilk? Simply mix 1 teaspoon lemon juice or plain vinegar and 2 cups of milk. Let it sit until it curdles, for about 10 minutes. 2. Breading is the key to crunchy skin. Prepare 2 containers: one for the seasoned breading, and another for a beaten egg or buttermilk. Step 1: Press the chicken into the breading, making sure it is evenly coated with no bald spots. Use oil that has a high smoke point like canola or vegetable oil. Fill a deep skillet or pot with oil until it is 1/3 full. On medium heat, bring oil to a steady 350F. A thermometer would be a great tool to have. One nifty trick to know if oil is hot enough is to drop a cube of bread into the oil—it should brown immediately, but not burn. Fry similar sized chicken in batches. Add the chicken a few pieces at a time, making sure not to overcrowd the pan. Adding too much chicken will bring down the temperature of the oil. 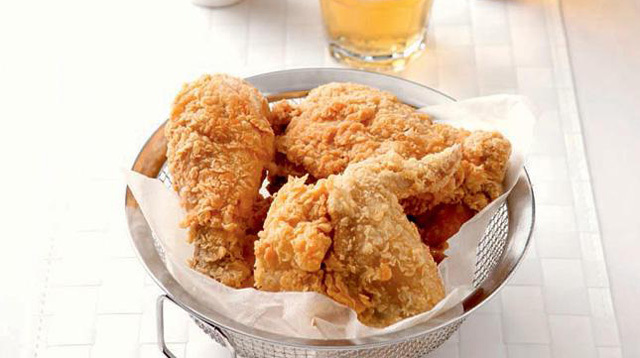 For more tips on how you can make the best-tasting fried chicken, check out Yummy.ph!